Everyone loves a winner ... and you and your child are sure to be the same when it comes to the winners of children's book awards. If you choose to read an award winning children's book you know that the book comes highly recommended and is very likely to be one of the best. The pick of the bunch. 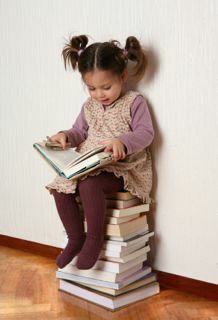 Many different children's book awards have been established over time, all with slightly differing qualifying criteria. Some are presented to authors, and others to illustrators. Certain awards are just for funny books, others for books about the African American experience. Some are judged by adults, some by children and some by a combination of both. So by checking out lists of award winning children's books you can get some great ideas for different types of books you might like to read. You can also look back over past winners, which go back over 70 years for the oldest awards, and pick some real classics which you may not otherwise have come across. The Database of Award-Winning Children’s Literature is a great resource for searching for award-winning children’s books which meet specific criteria. It has over 8,000 records from 89 awards across six English-speaking countries (United States, Canada, Australia, New Zealand, England, and Ireland). You can search on a variety of different criteria such as suggested reading age, country and historical period the book is set in and format of the book (eg picture book, chapter book etc). I have listed below some of the most prestigious and popular children's book awards focussed principally on picture books, starting with the oldest established awards. The awards are so numerous that they extend to two pages. Go to Page 2 for the more recent awards established after 1980. The Caldecott Medal Award was first awarded in 1938. This prestigious children's book award is presented annually by the American Library Association to the American artist of the most distinguished picture book for children published in the United States. The Medal Winners of the award are listed below. Several runners up, or Honour Books worthy of mention, are also awarded each year. 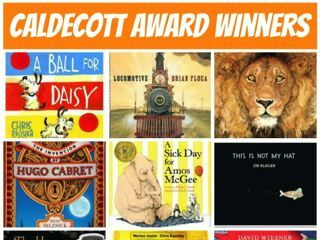 For previous Caldecott Award winners click here. The Kate Greenaway Medal has been awarded by children's librarians annually since 1956 for an outstanding book in terms of illustration for children and young people first published in the UK. The winners are shown below. You can read reviews of recent winners here. For previous Kate Greenaway Medal winners click here. These awards have been presented since 1967 for children's books published in the USA which fall into three categories, one of which is Picture Books. The decision is made by a panel of three judges. Previous winners of the Picture Book category of this children's book award are shown below. Click here for winners for all categories. For previous Boston Globe-Horn award winners click here. This annual children's book award is presented by the American Library Association for the most distinguished portrayal by both an author and an illustrator of African American experience in literature for children. It was first presented in 1970. The Medal Winners of both the Illustrator and the Author Award are listed below. Click here for the Honour Books, or runners up, for the Award. 2010 My People by Charles R. Smith Jr.
You can find Coretta Scott King Award winners for both the Illustrator and the Author categories for earlier years here. This children's book award was founded in 1971 and is one of the most prestigious and popular literary prizes in the UK. The winner is chosen by a panel of three judges - usually an author, a bookseller and a journalist. There are five categories of awards, one of which is for a Children's Book which must be written by a writer based in the UK or Ireland. The winners of the Children's Book category are listed below. You can find past winners for all categories here. For previous Costa Book Award winners click here. Continues on Page 2 for the more recent children's book awards established after 1980.